During the War Between the States the building served as a hospital and prison. The City of Winchester changed hands over 70 times during the War. The Frederick-Winchester Judicial Center opened in 1984 and all judicial functions moved out of the courthouse. It was used for Frederick County meetings and offices until 1995. 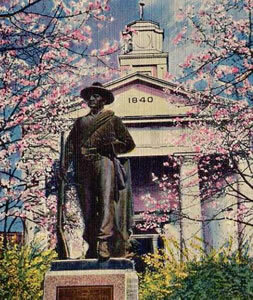 In 1996 the Committee appointed by Frederick County strongly recommended placing a Civil War Museum in the courthouse. Frederick County completed extensive renovation of the courthouse in 2003. Leading the project were Reader-Swartz Architects & Lantz Construction, who received an award for the historic renovation. May 24, 2003 the Old Court House Civil War Museum opened with a reenactment of Jackson’s march after 1st Winchester. Proceeds help with updating the Museum's exhibits and maintaining the Museum's collection.